The Churchill infantry tank is a most distinctive design with its extremely long chassis and wraparound tracks. Possibly named after the then-current British Prime Minister (there is some ambiguity in this regard), the Churchill tank was very well armored. It was produced in a series of versions that offered heavier armor and more powerful armament as the war progressed. The Mk.III, weighing in at 39,626kg, arrived on the scene in March 1942. It featured a 6-pounder gun in the all-welded turret, and the hull-mounted howitzer fitted in previous variants was deleted. Its baptism of fire was in the Second Battle of El Alamein in October 1942, in which six Mk.III tanks were involved. The Mk.III was also famously involved in the failed landing at Dieppe in northern France. 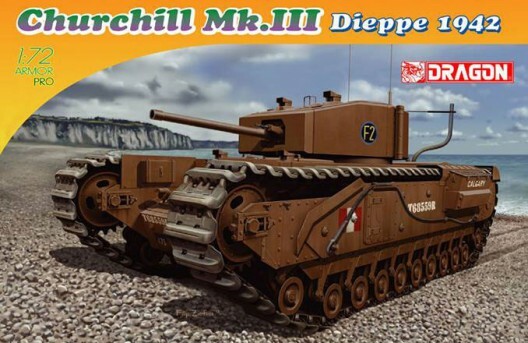 Dragon has created another version of one of the least aesthetically pleasing tanks of WWII, the Churchill III. Though marketed in the Armor Pro series, this kit is devoid of photo etch, much to the delight of some who do not like this material. 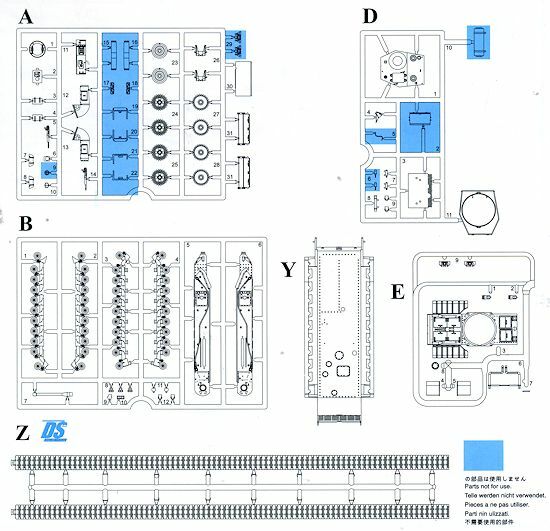 The kit does include Dragon's excellent DS tracks. Thanks to including the bogies as part of the side suspension pieces, all of that seam removal and painting of what would be a multitude of small parts is no longer an issue. In fact, in terms of parts count, this one is quite reasonable with only 605 in the final count. The turret and main gun are nicely done with the end of the barrel indented. The basic difference between this and the later Mk.IV is the turret and fuel tank. This one differs from the earlier boxin by having a new, abbreviated upper hull piece without the sand skirts and a longer exhaust to keep from flooding the tank as it exits the landing craft. Basically, sprue D is removed and sprue E is in its place. Below is a full list of features from the Dragon folks. 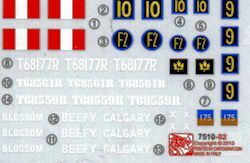 Markings in this one are provided for three vehicles. 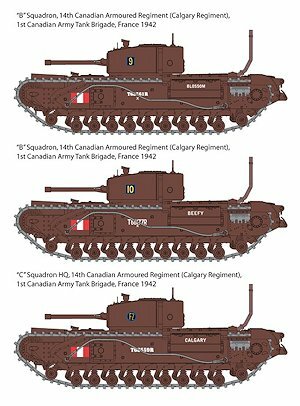 All of them are from the 14th Canadian Armored Regiment and differ in names and serials. All are in British OD. I know that many had hoped for a Crocodile, but I'd be willing to bet that will be coming. If you have not done a Churchill before, this one should fill a blank on your shelf.